Tokyo, Japan / Shanghai, China, September 5, 2013 -The Teijin Group announced today that Toho Tenax Co., Ltd., the group’s carbon fibers and composites business, and Shanghai-based Teijin Aramid Asia Co., Ltd., the group’s aramid fibers business, will participate in China Composites Expo 2013, Asia’s largest composites exhibition. The annual show will take place at the China International Exhibition Center in Beijing from September 11 to 13. Customers visiting the Teijin booth (stand AL04) will be able to learn about innovative applications for carbon- and aramid-fiber-reinforced composites developed by the Teijin group, a world leader in high performance fibers. Toho Tenax will introduce the latest technology in carbon fiber reinforced thermoplastic (CFRTP) by presenting an ultra-thin CFRTP housing measuring just 0.6mm in thickness, newly developed for use in smartphones and tablets. Also presented will be other molded products, such as bicycle wheels made with improved ultra-lightweight carbon fiber fabrics, and specially designed carbon fibers for pressure vessel. Teijin Aramid Asia will showcase two filament yarns – Twaron® Black and Technora® Black – deep-black versions of high-modulus para-aramid fibers that were originally available only in yellow. They are highly suited to applications requiring stiffness, strength, lightness and beauty, such as boat hulls and sails, hockey sticks, motorcycle helmets and other sporting goods. Other applications of aramid composites will also be presented, such as use in civil engineering, speaker cones and rods for circuit breakers. High-strength, high-modulus carbon fibers and aramid fibers are often combined with resin as composite materials for a variety of lightweight products. Composite materials offer attractive energy-saving and eco-minded solutions, and are increasingly in demand in China, which the Teijin Group has positioned as one of its key markets for future growth. 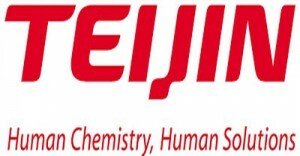 Teijin (TSE: 3401) is a technology-driven global group offering advanced solutions in the areas of sustainable transportation, information and electronics, safety and protection, environment and energy, and healthcare. Its main fields of operation are high-performance fibers such as aramid, carbon fibers & composites, healthcare, films, resin & plastic processing, polyester fibers, products converting and IT. The group has some 150 companies and around 17,000 employees spread out over 20 countries worldwide. It posted consolidated sales of JPY745.7 billion (USD 7.4 billion) and total assets of JPY 762.4 billion (USD7.6 billion) in the fiscal year ending March 31, 2013. Please visit www.teijin.com.